Please note that, according to the International Standards of Practice for Performing a General Home Inspection, the inspector is required to inspect the visible and accessible structural components and the general structure of the roof system. 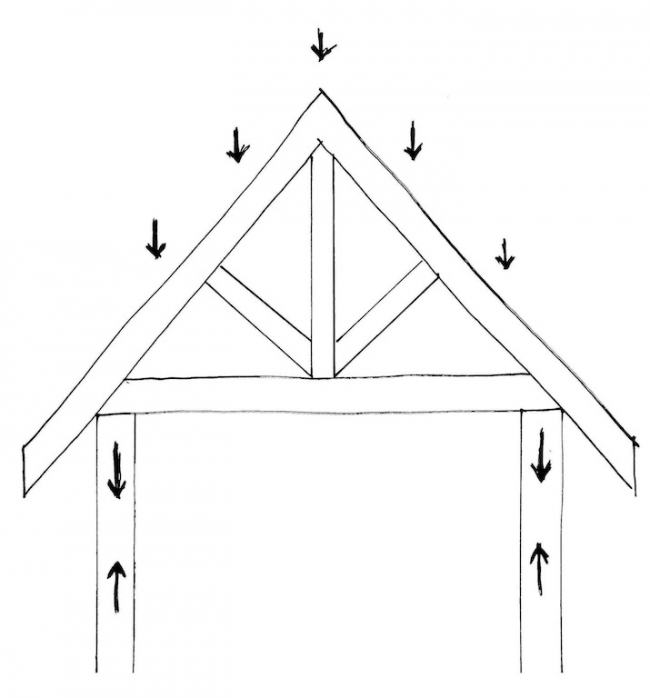 A collar tie is a tension tie in the upper third of opposing gable rafters that is intended to resist rafter separation from the ridge beam during periods of unbalanced loads, such as that caused by wind uplift, or unbalanced roof loads from snow. 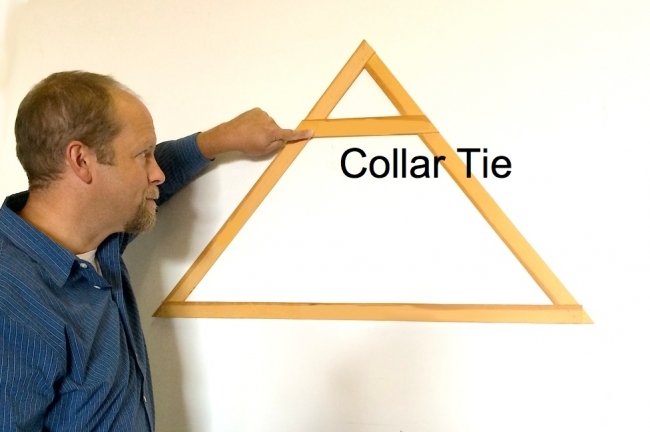 The 2015 International Residential Code does not require collar ties (or collar beams). However, in those situations when they are specified, collar ties or ridge straps are usually installed in the upper third of the roof between opposing rafters. In high-wind areas, uplift can tear a roof off of a house if it’s not properly attached. Collar ties are probably not needed if approved metal connectors were used to fasten the rafters to the ridge. 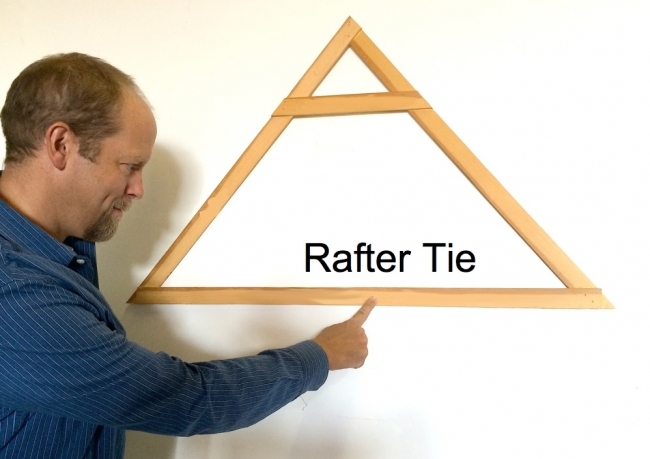 A rafter tie is a tension tie in the lower third of opposing gable rafters that is intended to resist the outward thrust of the rafter under a load. In many situations, you’ll find that ceiling joists installed parallel to the rafters are intended to function as rafter ties. The roof framing mock-up below shows a standard rafter tie. Rafter ties resist the outward thrust that rafters exert on the exterior walls. They help keep walls from spreading due to the weight of the roof. When the walls spread, the ridge board might sag. 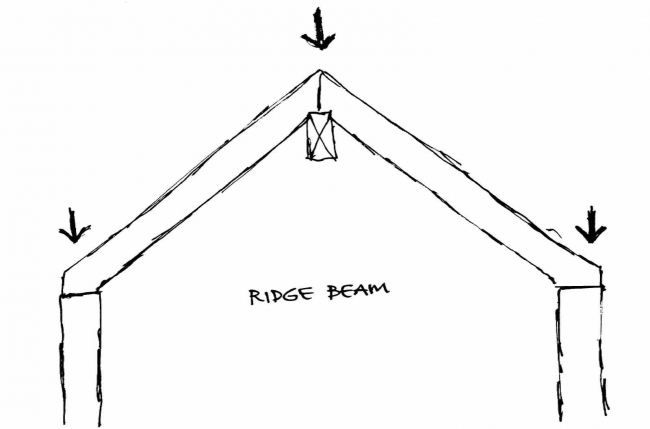 A sagging ridge is one indication that the roof structure may lack adequate rafter ties. 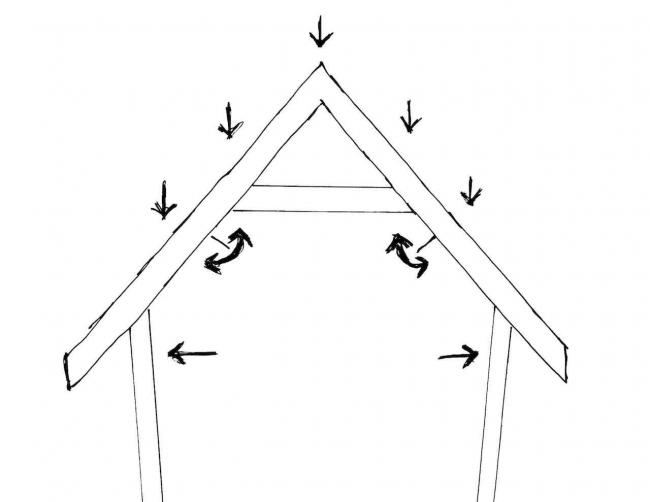 A rafter tie forms the bottom chord of a simple triangular roof truss. The ends of ceiling joists should be lapped a minimum of 3 inches, or butted over bearing partitions or beams and toenailed to the bearing member. Where ceiling joists are used to provide resistance to rafter thrust, lapped joists shall be nailed together in accordance with Table R802.5.1(9) in the IRC. For example, if a house has a 4:12 slope, the rafters are on 16-inch centers, the snow load is 30 psf, and the roof span is 28 feet, you need eight 16d common nails (or 40d box nails) at each rafter-heel joint connection. That’s a lot of nails a home inspector can look for. 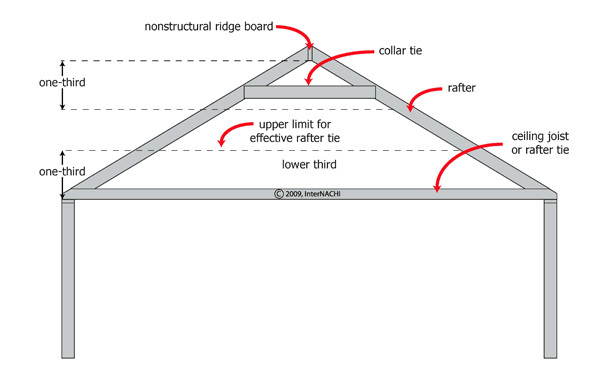 In summary, collar ties and rafter ties perform different functions, but both are essential roof-framing members, and it’s useful for inspectors to be aware of their differences in order to properly call out defects.